General Motors' Central Office Production Order to the fullest, giving us some truly terrific muscle car options. By judiciously picking hi-po OEM performance parts to augment some already formidable performers, COPO Chevrolet Camaros from the late '60s put a few dealers on the national map, and today, we know about Berger, Nickey and, of course, Yenko. Well... the Camaro is certainly back, but where are the modern COPO versions? If you live near Albany, New York or Claxton and Jessup, Georgia then the cars are right down the street at your local dealerships. DeNooyer Chevrolet of Albany has dipped into GM's Performance Parts catalog and come out with an LSX454 engine. After stuffing it into a Camaro, they know have a 620-horsepower coupe prowling their lot. 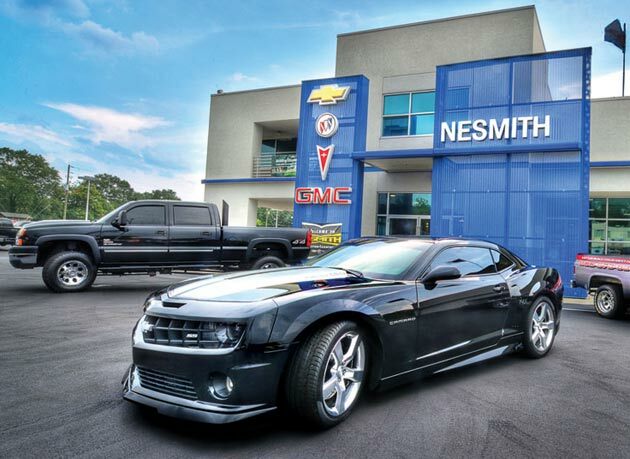 In Georgia, NeSmith Chevrolet also took a look into the catalog and put in an order for supercharged LS9 normally found in a Corvette ZR1. Their NeSmith Storm Camaro puts out nearly 700 horses. In other words, the COPO is back! Check out our gallery below and then hop the jump to see video clips of both cars. Thanks for the tip, Tony! Report: Two Chevy dealers offering special 700-hp Camaro models - just like Yenko and Berger [w/video] originally appeared on Autoblog on Fri, 31 Dec 2010 19:01:00 EST. Please see our terms for use of feeds. I don't really care for that front lip. Now if it was steel, and very sharp, it would be a different story.